CHRISTINE POULSON » A marvellous painter that I’d never heard of . . .
A marvellous painter that I’d never heard of . . .
. . . even though I did History of Art and taught it at degree level. 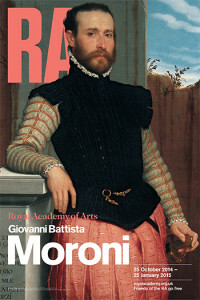 Giovanni Battista Moroni was a sixteenth century Italian artist, a contemporary of Titian. There is an exhibition of his work at the RA until 25th January. I was entranced by it. It is mostly portraits with a few altarpieces and it reveals him to be one of the really great portrait painters of any era. What struck me most about them was their modernity. Portraits of this period – indeed, most periods – are about displays of power and wealth. These are too, of course, but take away the trappings and just look at the faces, and these could be people you might see walking walked Piccadilly. It is something about their expressions: a certain guardedness, an inwardness, that I hadn’t expected to see. I felt a real connection with them as individuals. A marvellous exhibition, quite small, and all the better for that in my view. It’s possible to see everything and really take it in. And Moira at ClothesinBooks.com if you are reading this, there are some fabulous clothes in there!